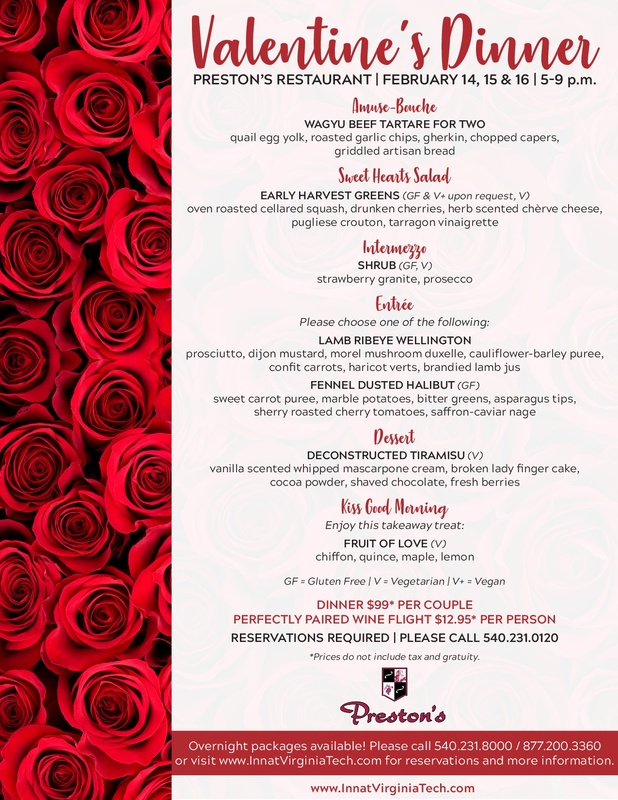 Preston's, located within The Inn at Virginia Tech, presents the 2019 Valentine's Dinner starting on Thursday, February 14, 2019 through Saturday, February 16, 2019 from 5:00-9:00 pm. Treat your Valentine to a romantic dinner for two! Enjoy an intimate atmosphere along with live music from Bobby and Wynne Parker. Add perfectly paired wines for the ultimate romantic dining experience featuring five courses. Courses include: Amuse Bouche, Sweet Hearts Salad, Intermezzo, Entree and Dessert along with a takeaway treat. Entree choices include Lamb Ribeye Wellington or Fennel Dusted Halibut. To view the full menu and event flyer, visit: https://i.imgur.com/HuZm0sd.jpg. The cost is $99.00 per couple and a paired wine flight is available for $12.95 per person. Note: Prices do not include tax and gratuity. Reservations are required. To make a reservation, call 540-231-0120. For more information, visit: http://www.InnAtVirginiaTech.com or call 540-231-0120.